8 pp. Roman, 185 pp. Dizi is an Omotic language of the Afroasiatic language family. It belongs to the so-called Dizoid group, which is part of North Omotic. The 2007 Ethiopian Census reported 34,680 Dizi, while 33,927 (i.e, almost 98% of the Ethnic Dizi) reported Dizi as their “mother tongue”. The Dizi people live in the Dizi District, whose capital is Maji (Amharic), from Dizi maasht “high place”(Gascon 2007). It is located at an altitude of 2,430 m and was founded after the Amharic conquest of the area in 1898. Site of a British consulate in the 1920s, in the 2004 Ethiopian census it had almost 3,000 inhabitants. 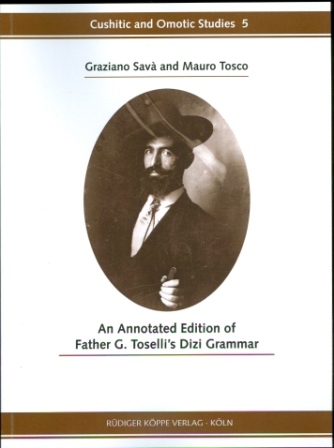 The authors of the grammatical description and dictionaries which are the object of the present study, Father Giovanni Toselli (1883-1959) and Father Giuseppe Goletto (1890-1970), were Piedmontese missionaries (writing in Italian) who worked among one of these southern groups. Father Giovanni Toselli was born in Cuneo (Piedmont) in 1883. Aged 20 he entered the seminary of the Istituto Missioni Consolata. Two years later, in 1905, as soon as he was ordered priest, he left to Kenya. Among others Toselli was the first Consolata missionary who worked among the Kikuyu of Kenya. In 1915 he asked to be sent to Ethiopia. He gave a remarkable contribution to the pro­duction of studies on Ethiopia. 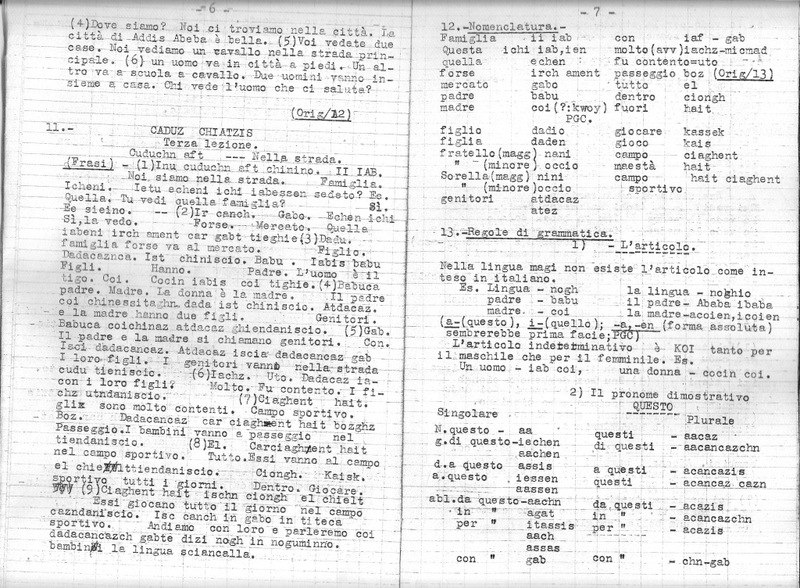 The country in general is treated in the manuscript Note di viaggio in Abissinia (1937-1938), whose date is unknown. 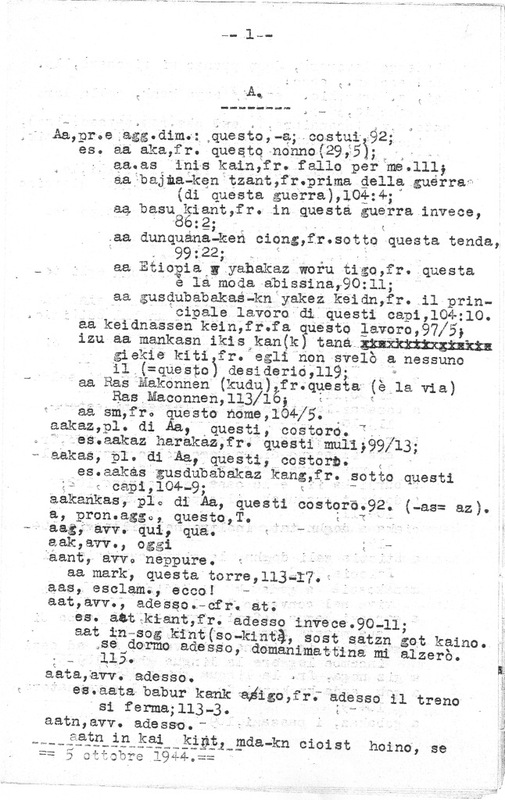 His linguistic works are three dictionaries and one grammar of Amharic, a translation of the Storia Sacra in Amharic and two descriptions, including a dictionary of Dizi, the language spoken in the area of his Maji station, which is also the name he gives for the language (Magi in the Italian spelling). 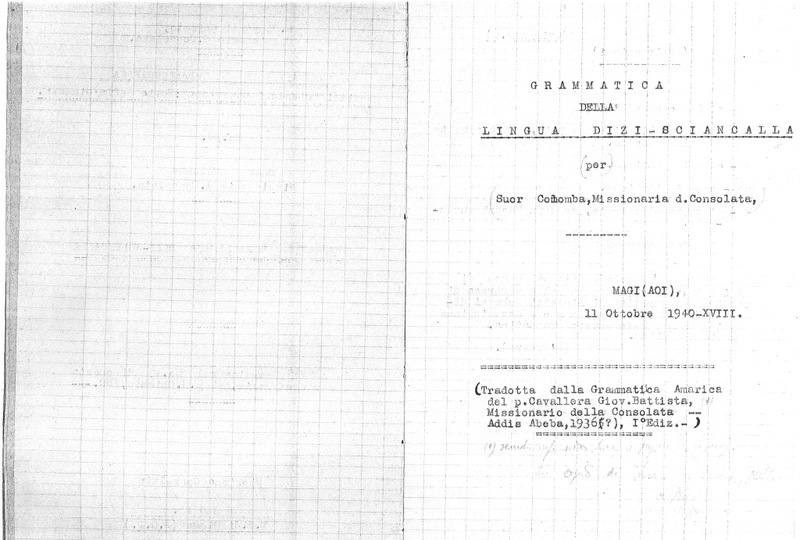 Elementi di Lingua Maji (1937/1939) is one of the two manuscripts which are presented in the present publica­tion. It is entirely in Italian and has never been published before. The editors of the present volume possess the original booklet which is a small volume with 204 pages, a grey soft cover, and a type-written text. The volume is in good condition and is readable in all its parts. Most of the booklet consists of linguistic notes and a glossary. The introductory part provides ethnographic and historical information on the people including detailed maps. Before going into the analysis of their work, the authors give an overview of the history of the Catholic missions in Ethiopia and the activity of the Istituto Missioni Consolata, the congregation to which Father Toselli belonged.